Improving contact center efficiency remains a top priority for most service professionals. Yet, the impetus for doing so has shifted from a conversation about cost toward a greater focus on the customer experience. The reason is simple: contact center efficiency costs are intertwined with the customer experience. Increasingly, controlling cost in the contact center depends on the extent to which an organization can meet the growing demand for A+ customer self-service experiences. When I have a question, customers now ask, is it quick and easy to find an answer? 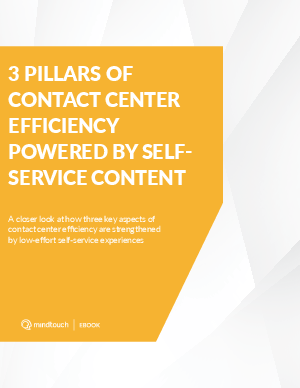 Three important pillars of contact center efficiency now depend on the answer to this question.